Homecoming is a celebration that many churches have every year. It is commonly celebrated around the time when the church was created and honors the longevity of the church, sort of like an anniversary or birthday celebration. Homecoming, as its name implies, is also a time when former members who have moved away traditionally come back to visit the church and see old friends. When you are celebrating homecoming at your church, put together a program to celebrate the occasion and to welcome members back. Obtain a list of former church members who have moved away, along with former church staffers, pastors and other people who have been important to the church family. Send invitations about the homecoming celebration a couple of months in advance so that out-of-town people can make arrangements to be there. Put together a dramatic reenactment of how the church was created using current church members as actors. 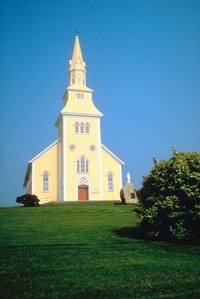 Write a simple script that tells about the beginnings of the church, and dress the actors in period costumes that reflect the styles of whenever the church was created. Plan the reenactment for the beginning of the homecoming celebration. Make scrapbooks for each decade that the church has been in existence. If the church is very old, it might be easier to do this for every 20 or 25 years. Use old pictures, church fliers and other things to touch on accomplishments of the church during those years. Place the scrapbooks on a table so that people can look through them. Find both old and new pictures of church members engaging in church activities. Blow up the pictures and place them on easels around the sanctuary or the fellowship hall, or frame them and hang them on the walls. Ask a current deacon, Sunday school teacher or someone else who is active in the church to speak during the program. This person can tell the people who are not familiar with the church anymore all of the things that members are doing now. That way, you will have touched on the church's past and present. Invite a former pastor to come back to the church and give a sermon. If several former pastors are available, include all of them and give each a few minutes to speak. Finish the homecoming celebration with a meal. Serve a potluck dinner in the fellowship hall or outdoors for an old-fashioned church picnic.